I wonder if you take a hot air balloon ride if they would let you fling a few paper airplanes over the side. They are constantly killing people by dropping sandbags on them. 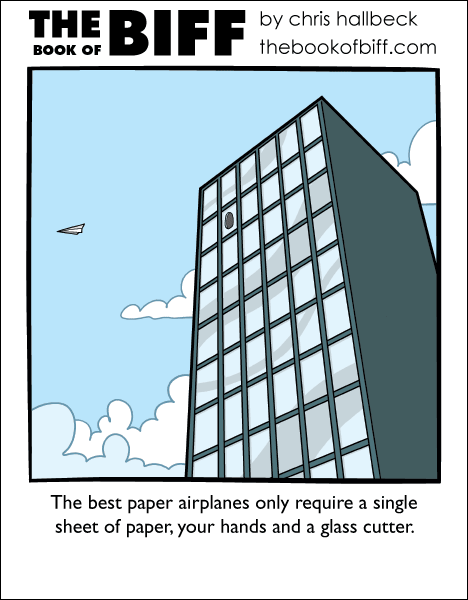 Surely a few sheets of paper could squeak by. Synchronized Biff & Maximumble week? It was not a hot air balloon but it was 100 paper airplanes from the stratosphere… a marketing gag of samsung i think: http://projectspaceplanes.com/ (I’m not affiliated with them in any way). But still cool! If you’ve got about $15000 to $20000 (I think thats how much it is) lying around (and who doesn’t besides me) you can get your own CubeSat (micro satellite) and design it to launch your paper plane in space (gratuitous parenthesis). Slogra: Granted, paper is a lot softer than metal… plus anyone you hit in a vacuum would either be armored enough to take it (micrometeorite protection is part of space-suits, right?) or doesn’t have long to live anyway. If there is atmosphere happening between the drop and the impact point, it would burn up. The penny thing is a myth. I think it was even “busted” on Myth Busters. Or one of those boulders you use to buy a wife! Me, I once threw a paper airplane from the highest part of the Eiffel tower they let you up to. Unfortunately it was at night.